They say that Cavendish banana’s are the better banana to cook with but I’ve never had any complaints about banana bread made with Lady Finger bananas. We used to get a glut when all the bananas on the Tiffin’s tree next door all ripened at once. 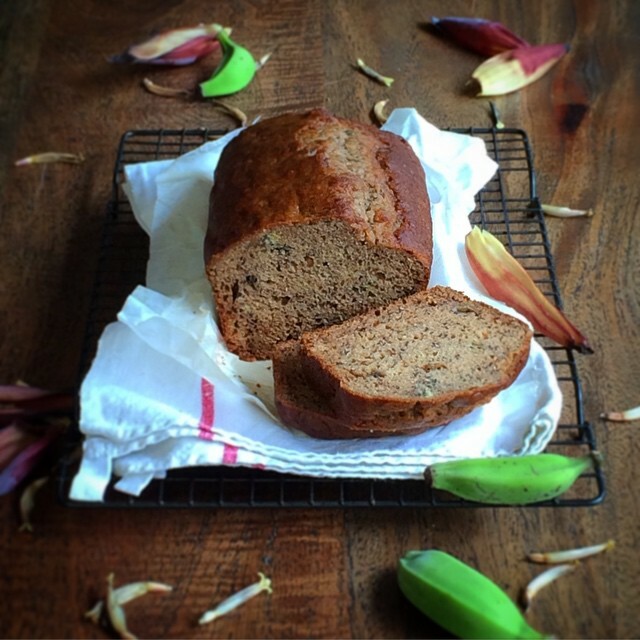 Banana bread is the only recipe I know of when it’s better if the ingredients are overripe. This recipe uses plain flour combined with baking powder rather rather than self raising flour (see Flour Facts) which makes it easier than mucking around with both types of flour. If you don’t have baking powder, the recipe calls for 1 3/4 self raising and 1/4 plain flour. Preheat oven to 180°C. Lightly grease an 11 x 21cm loaf pan with melted butter. Line the base and sides with non-stick baking paper. In a large bowl, sift the plain flour and baking powder together at least twice to combine then add the cinnamon. Stir in the brown sugar, ensuring there are no lumps and make a well in the centre. In a separate bowl place the milk, eggs, melted butter and mashed banana and stir until well combined. Add the banana mixture to the flour mixture and stir until just combined. Spoon the mixture into the prepared pan and smooth the surface. Bake in preheated oven for 45-50 minutes or until a skewer inserted into the centre comes out clean. Remove from oven and set aside in the pan for 5 minutes to cool before turning out onto a wire rack. Photo thanks to #nadine_shaw and her “dodgy” iPhone.